Disclaimer: This is a sponsored post written by me on behalf of One 2 One Network. I received sample product and a sled and snowball maker (which I sadly didn't get to use for the post, as we've had no snow) to facilitate my post. All opinions are my own. 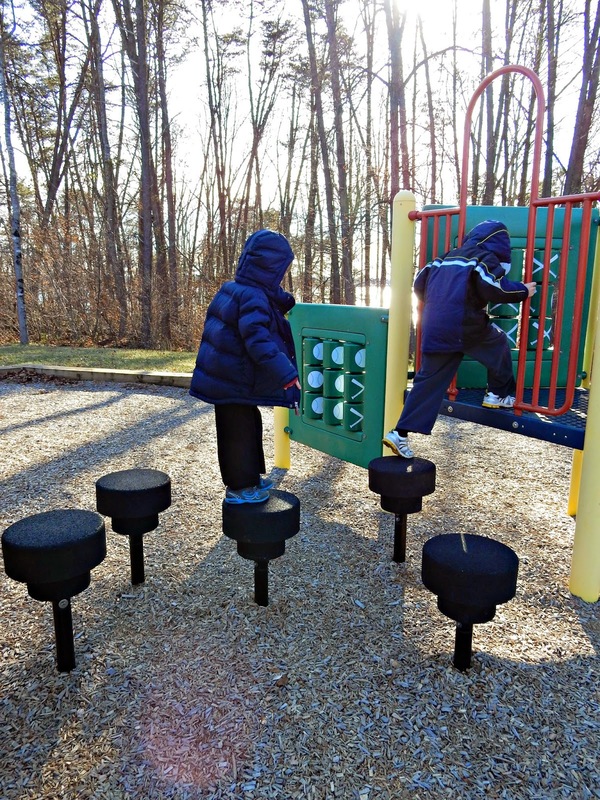 Even in the cold winter months, we tend to spend plenty of time outdoors. I continue my running, my husband cycles and chops wood, and the boys do what boys do when you live on an acreage with plenty of room to roam. Between the dryness of our wood stove and the time spent outside in the wind and cold, our skin takes a beating. I've had eczema patches behind my knees for the first time ever this winter, and Cort struggles with it every winter, often waking up in the middle of the night crying over painful and itchy patches of skin. Vaseline sent us some of their Intensive Care Advanced Repair lotion to try. I was thrilled to see it was fragrance free, since Cort has asthma and is sensitive to fragrances. This lotion goes beyond basic hydration. It deeply moisturizes and is clinically proven to heal dry skin in just 5 days. The formula combines humectants (to draw water into the skin) and healing micro-droplets of Vaseline Jelly (to lock moisture in). Paul went for a four hour bike ride, after putting some on his face. He said his face gets really dry from the wind on long winter bike rides. 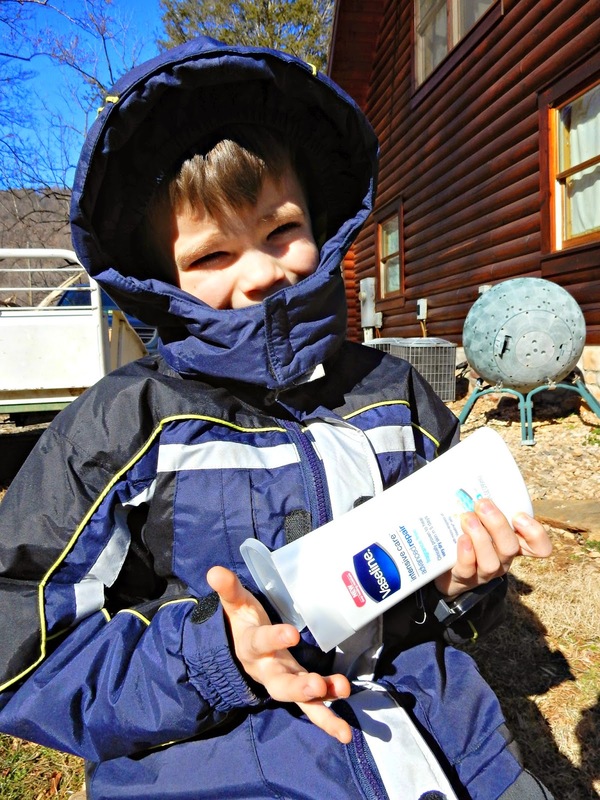 Vaseline helped protect his face from the wind, and afterwards he told me he could really tell a difference. 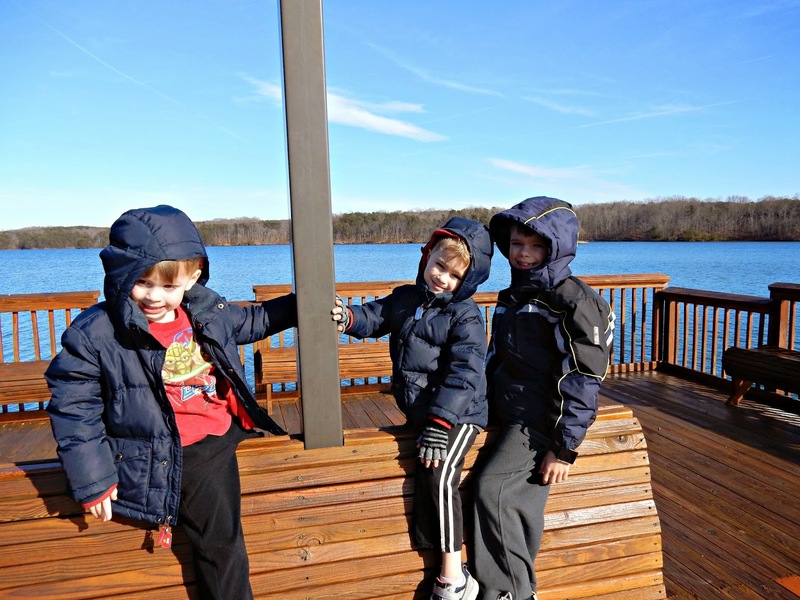 Meanwhile, I lathered up the boys with Vaseline and layers of clothes, and we headed out to a new community park at Smith Mountain Lake. 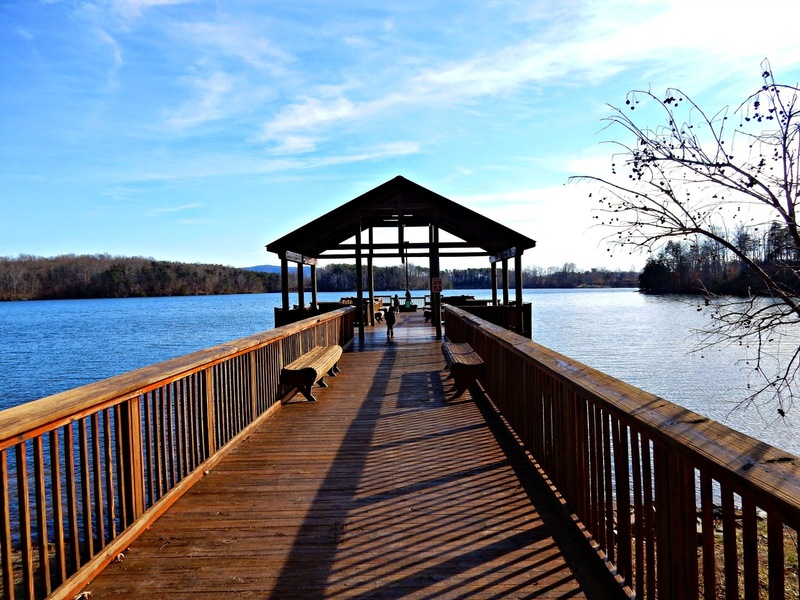 Even though it was a chilly and breezy day, we were happy the sun was out, and the water was gleaming. When it is cold, the boys often complain about their hands hurting. I've noticed their skin has become rough and dry after playtime outside this winter. On this day, no one complained about their hands hurting. I think the Vaseline really offered a nice layer of protection. 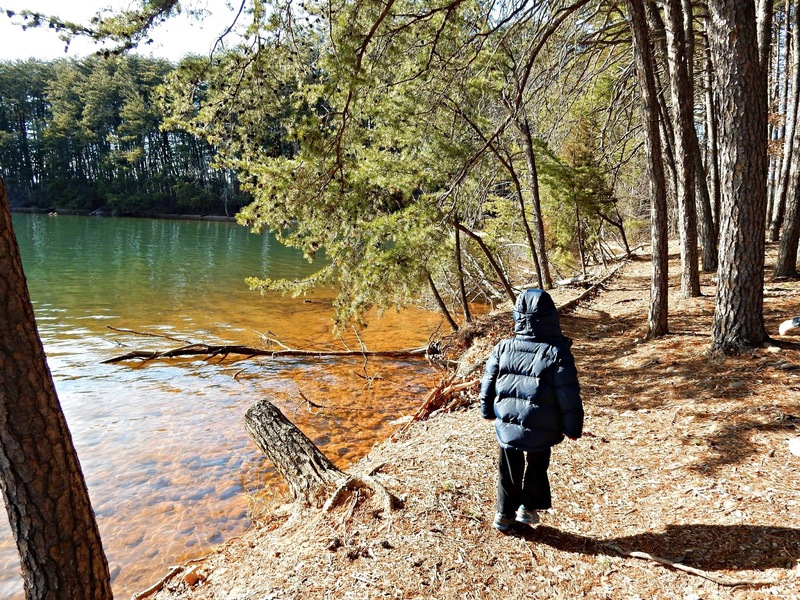 After checking out the dock, we went for a hike along the water, through the woods. It was so nice to get some fresh air. The boys were full of smiles. I'm thankful we live in Virginia, where taking appropriate steps before going outside can protect you from the elements for most days of the year. 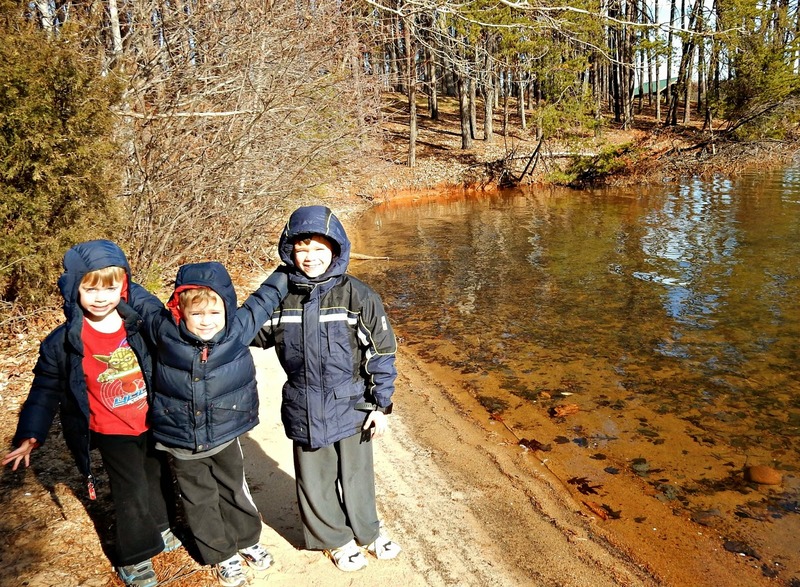 After our hike, the boys weren't tired or too cold at all. They were all ready to check out the playground. There was a good breeze blowing, so I do feel like there was plenty of wind exposure going on during the time we spent outside. Yet the boys didn't complain. 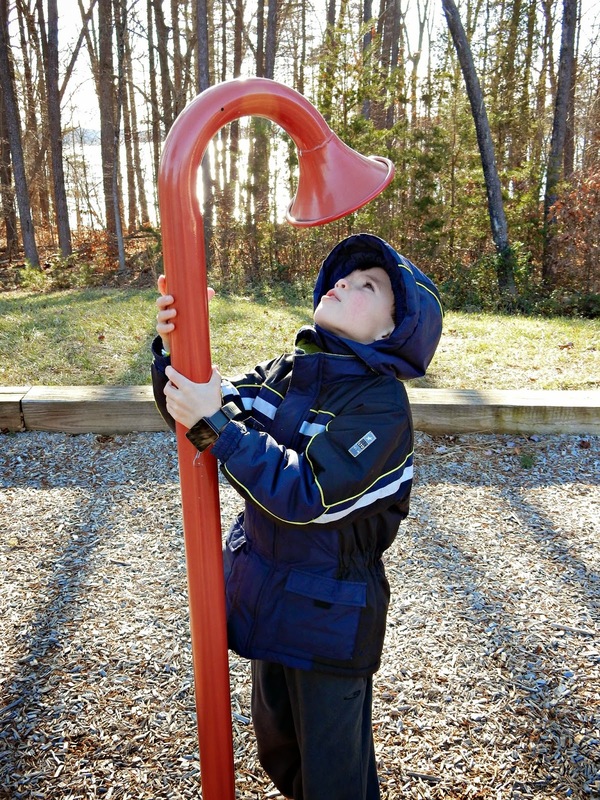 Here, Pierce tries out one of those voice amplifiers, which transmit to another one across the playground. It wasn't until the boys got hungry that they were finally ready to go. When we arrived home, I was so pleased to see that their skin had held the moisture well, despite our extended stay outside. And the boys? They slept well that night! It was a wonderful day, and we will be sure to be outside one winter day in the near future, particularly with a layer of Vaseline Intensive Care to protect from dropping temperatures. Readers, do you struggle with dry skin in the winter months? 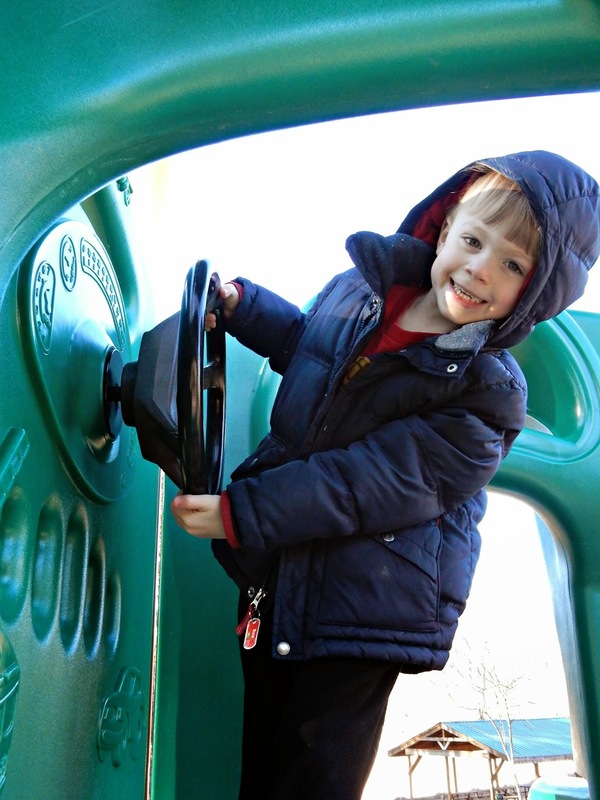 Looks like the boys had a great time at the new playground and glad to hear that the Vaseline did the job and kept their hands soft moisturized. I am going to go buy some of this today. Worse than dry outdoor skin is dry old lady skin after outdoor exposure. Thanks for posting this. I have tried so many products, but have never bought this one. I will let you know if it works on skin that is dry from the inside-out. never put it on before, always after when I need it. I use olive oil sometimes. Thank you so much for that recommendation and I plan to get some today. Yes, we have very dry skin in the winter, and even a little in the summer to. Looks like your day outside was fun for you and the boys. Oh, yes, my hands look awful this time of year. And if I drive without gloves and the steering wheel is cold, my hands start to itch. :-( I've always liked the Vaseline lotions. I'll have to look for this kind. Your boys look so cute! sounds like a very worthwhile product! Best stuff ever, we use it all the time! 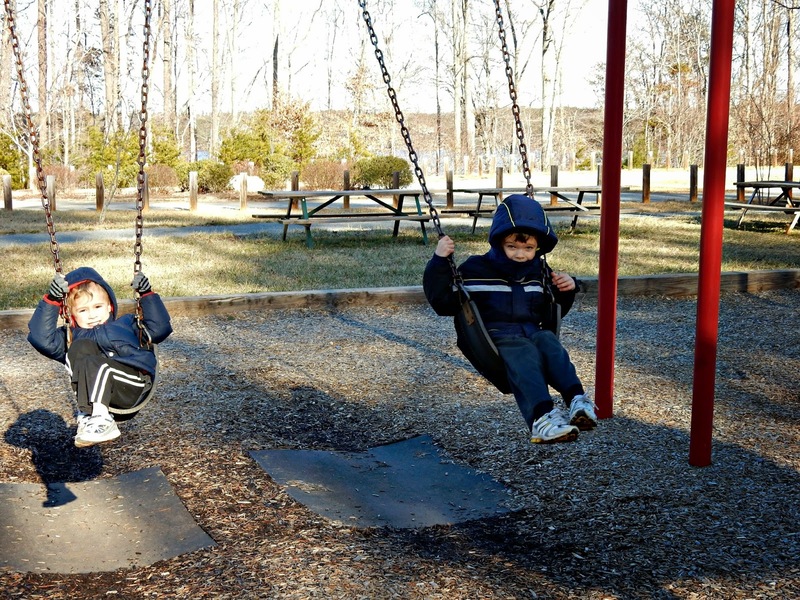 Your boys look like they are having a blast, I wish our playgrounds were without snow and ice! Yes I do. My skin literally peels off. I have a big basket with all kinds of moisturizers, and also keep small tubes in the glove compartment and my purse. I am going to check and see if I have this. If not, I will buy some at the grocery store when I go today. I love the pictures of the boys! Especially the three of them all together by the water. That's a super pier shot, too! These photos are so cute! Makes me want to head outside! I used to use that --but haven't in a long time. Glad it still works so well. We are headed out tomorrow and the temps are going to be FRIGID.... Maybe we need some of that lotion!!!! I used your Red Velvet Brownie Recipe --but made muffins... It made 12 good sized muffins --and I baked them at 350 for 20 minutes... Came out GREAT... THANKS!!!! I have a lot of issues with dry skin in the winter. I keep a vaporizer going near constantly until spring is officially here. That helps. Right now I am trying a different product than this one, and it works ok, but too thick and greasy feeling. I will have to try this one. Thanks for the tip! Such a beautiful family you have! You seem like a great mom. I will have to try that on my dry skin. When I am out in the cold I really have found Aquaphor to help keep my lips from being chapped or windburned. Seems to work much better than simple chapstick. Just got back from Martins, and I got bottle! 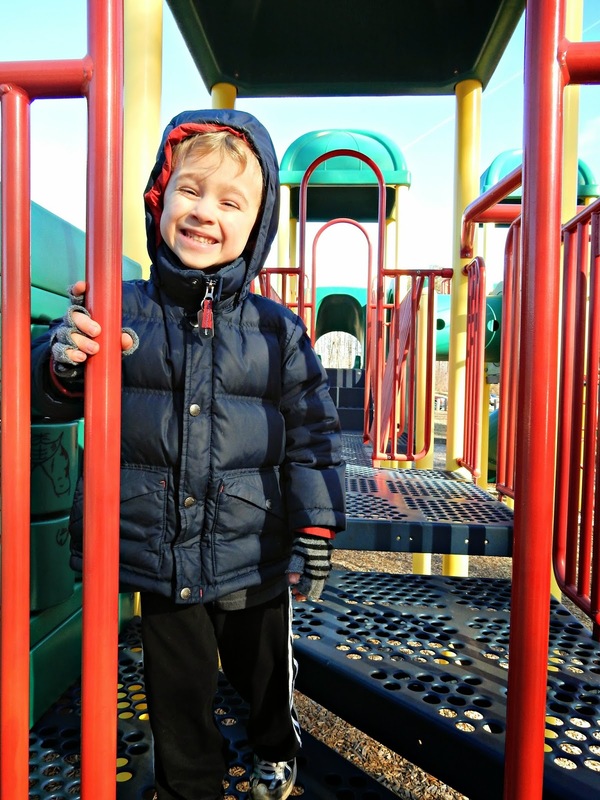 It's good to see youngsters enjoying the outdoors even in chilly weather. I'm glad you've found a product that helps. I'm almost out of mine and you've reminded me I need to buy more when I go shopping next. I have been using it for quite a while now and am very happy with the results. Great commercial! It is good stuff. 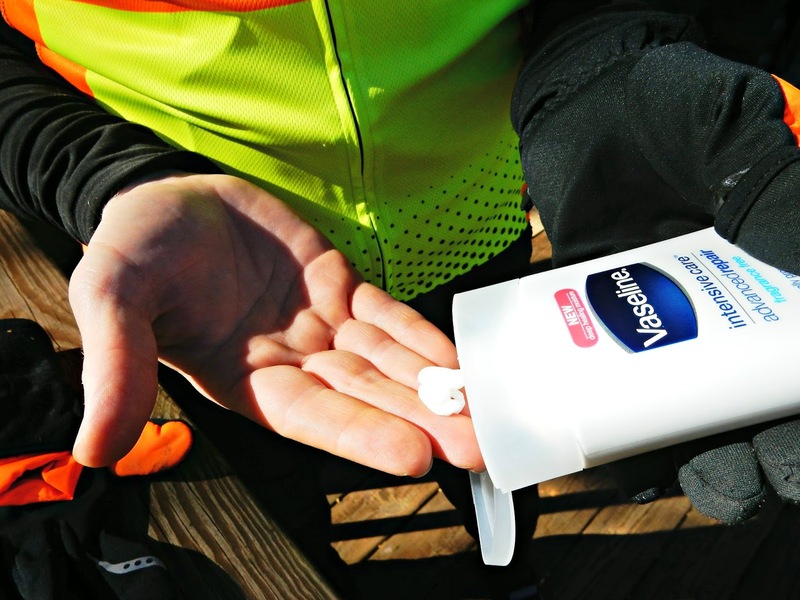 I've used Vaseline lotion in the winter for many years and always found it to be very satisfactory. good reminder! I'll be buying some this weekend. :) your boys are adorable! Beautiful place! And a happy moment! The winter sure goes bring the dry skin. We have a bottle of this on our dresser and I use it daily. Looks amazing. We had lots of snow and can use major moisturizers. Yes, this winter has been particularly dry. My hands have felt rough! They are so adorable! Sorry you're struggling with eczema, my grandmother had it so I know it can be miserable. I have trouble with my hands drying out, chapping, even having the skin on my fingers split... I'll have to give the Intensive Care a try! Yes. Mica always gets some mysterious spot on him somewhere. I never know if it's eczema, or something else. I wish I lived with a skin doctor.